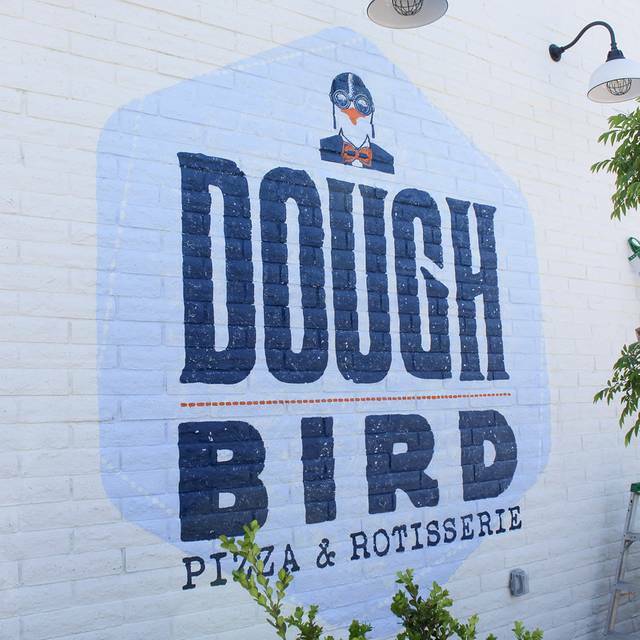 Doughbird is the latest Sam Fox restaurant. The menu, created by Sam Fox and Chef Clint Woods, combines our two favorite styles of cuisine – pizza and rotisserie. It’s a friendly place to indulge in savory creations like crispy pastrami pizza with gruyere cheese, or Rocky Free Range rotisserie chicken served with house-made sauces like chipotle barbeque or a delicious jalapeño pesto. Signature sides like brussels sprout & kale and cauliflower mash will leave you stuffed and satisfied. Visit Doughbird for a warm, inviting experience and break bread with the best people in your life. *These items may be served raw or undercooked. Consuming raw or undercooked meats, poultry, seafood, shellfish, or eggs may increase your risk of foodborne illness, especially if you have certain medical conditions. While we offer gluten-free items our kitchen is not gluten-free. Slow service. Waited about 15 min for our drinks to appear and another 15 for the appetiser. The prime rib my husband had was excellent but my pizza was so salty I couldn’t eat it. The Manager did apologise and took the pizza off our bill which we very much appreciated. The restaurant is loud so it can be difficult to hear your dinner partner. Super yummy gluten free pizza crust. It was a special treat to have. This was our fourth time here, Food excellent every time! Nicole was an excellent server! Love the food and service. It is always perfect. Wish it was not so loud inside the restaurant. 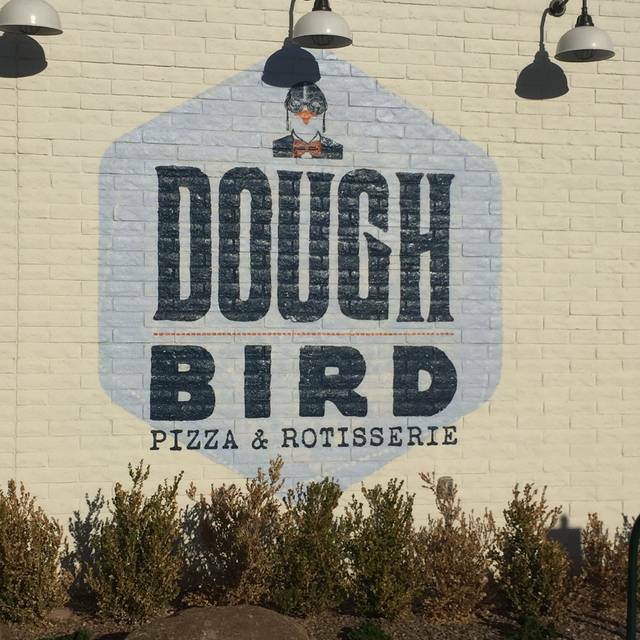 We love Doughbird and would love to give a 5 star review but although all the food was delicious, the entrees were barely warm. I had the chicken and my husband had the prime rib. Both were very good but they were not very hot. We enjoyed several appetizers and they were hot and delicious. The service was excellent and it was a wonderful evening. Doughbird is still one of our favorite restaurants. Everyone had a different menu item, all were chicken, and each really enjoyed their dish. Our server was attentive, witty, and professional. Seems like the food gets better each time we go here. Now it’s pretty hard to beat. I will admit, we are very partial when it comes to Fox Restaurants. We haven’t found one that we disliked. Doughbird is another spot where we will definitely be coming back to! I had the BBQ salad and it was very tasty! Excellent service and good value. Great place for all ages. On Fri 3/29, 3 of us ordered 3 meals: a Margarita pizza, prime rib and the Chicken Pot Pie. The only meal of any consequence was the Chicken Pot Pie. The pizza fell flat: plain tasting and over-cheesed. Even the addition of roasted garlic, mushrooms and olives didn’t help, except for the wanting of more garlic, mushrooms and olives. The prime rib, order medium rare, was closer to medium well. It was over-cooked, dry, and grainy. There was as much fat as there was meat, and it was served almost cold. The addition of the Mac and Cheese was a huge mistake. It was flavorless and served in such a small amount, it could not be assumed to be a side, but an amuse. The mac and cheese was replaced with over-cooked, seemingly over-boiled broccoli. Again, served cold, and with so much water that one would have thought it was soup. Water glasses were not refilled , and drinks were not reordered because it was evidently assumed we didn’t wanted more, so we were never asked. I had been to Doughbird before and had a great food and service and overall nice evening out. So an occasional negative experience is not unusual. What I ordered and what I received for the price I anticipated, was greatly different. The initial management explanation was about what it used to be and what it is now instead of really addressing my issue until I mentioned it to them 3 times. Aside from a rather pesky fly that would not leave us alone, it was a lovely lunch. Love this restaurant! Great food! Great service, fun atmosphere! Love this place, can’t wait to come back and try more. We were in town for one night and picked this place for a fun dinner experience. It was awesome. Great atmosphere, wonderful, creative food, and very friendly staff. Wish we lived in Phoenix so that we could return! Excellent food and service as always. Will certainly go back again! Love this busy, fun restaurant. Sitting at the bar is best, IMHO. The curry chicken is out of this world. Excellent. Favorite was the pot sticker appetizer. DELICIOUS!!! Great concept, well executed. A little noisy, but not objectionable. A little on the pricey side, but leave that behind and enjoy the experience. Food was ok. Pizza burned and not as good as sometimes. Our server, Chelsey, was adorable, attentive and all-around amazing! As always, the food was prepared well and all of us thoroughly enjoyed our meal! A great waitstaff, too! The food was tasty and the service was excellent. Our waiter was very understanding about my dietary restrictions. He took my information and submitted to the chef who made me a special dish. I am always very appreciative of this level of service. The pizza was delicious, and the staff was very friendly. I wish you still had the corn side dish. It was the best. Not sure why it's been discontinued. We are frequent visitors to the restaurant. Went with my husband and daughter to celebrate his birthday. The server did a great job making all of us feel special, especially the birthday boy. Food was really good- especially the rotisserie chicken! I wish we lived closer by, we would definitely be regulars. However, when we're in the area, we will definitely be back. Excellence ! Prime Rib was awesome. I advise Reservations! Really happy first time experience. Chicken pot roast was excellent. I thought the pizza was average but my wife thought it was very good. Average when you compare to Federal pizza and similar levels of pizza. Overall good experience, would definitely recommend. The food was good and so was the service. We went to Doughbird to celebrate a 12-year-old’s birthday. It was our first time at the restaurant. We enjoyed the meal. It was family-friendly, yet fun on a Friday night. Seated upon arrival even though we were 1 hour early. Wait staff were friendly and accommodating for all in our party including my friends 3 year old. Food was delicious and we will definitely be back. Love Doughbird. The best pizzas and great rotisserie chicken. They also have low carb sides for keto dieters. Enjoy Doughbirds anytime I go. Friends love it. This restaurant offers gourmet pizzas, friendly servers and a nice atmosphere for families. They offer gluten free crust that is excellent. Sure wish there was one in Tucson!